FirstByte Review 2019: Is FirstByte a Good Hosting? FirstByte is a web hosting provider based in Russia. With two large data centers located in Moscow, this hosting provider is able to provide advanced hosting solutions to medium-sized businesses as well as large corporations in Russia and beyond. FirstByte is a Russian-based web hosting company that provides virtual servers, dedicated hosting, domain registration, and DNS hosting. The vendor also has a noteworthy presence in the Netherlands, Vietnam, Ukraine, and China. The FirstByte website is only available in Russian. FirstByte hosting solutions are powered by a fully redundant Cisco backbone network. Unfortunately, FirstByte virtual servers are known to fail quite often and sometimes develop overloading related errors even when using KVM virtualization resources. This often results in many hours of client website unavailability. FirstByte data centers are highly monitored by their security team and have a 24/7 CCTV surveillance system of up to 350 cameras recording all activities in these locations. The hosting provider also offers DNS hosting as an additional package, though it does not work quite as advertised. Customers report inexplicably losing access to the DNS control panel and their domains being removed from the system. The manual process of adding them is tedious and can result in the loss of website data. 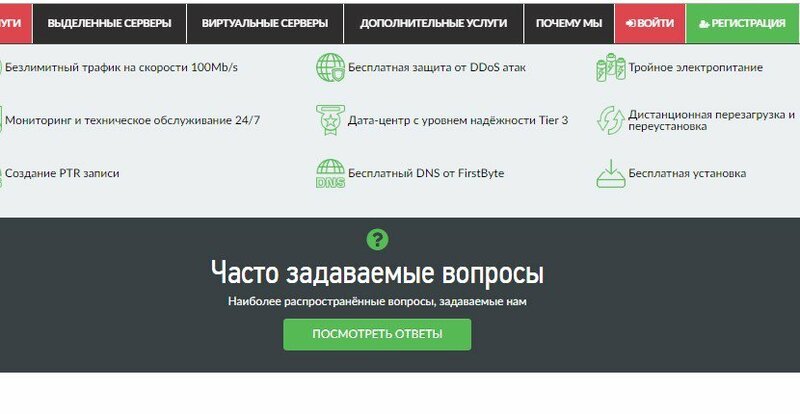 FirstByte prices compare favorably with other hosting vendors in Russia. They offer budget-friendly plans that come with quality hosting features. The vendor’s hosting plans are priced in Russian rubles with flexible payment periods of one, three, six, and twelve months. FirstByte offers a 99% uptime network guarantee for their virtual servers, falling short of many customers’ expectations of an uptime of at least 99.99%. That said, in case of downtime, they do have a compensation plan in place. FirstByte has a refund policy of 30 days, but for users who want to test their services, the vendor encourages them to use the hosting plans that allow for daily payments. It’s also important to note that customers have reported the vendor resetting their VPS servers because of delay in payment of as short a time as 48 hours, resulting in the loss of all website data. Clients can contact the FirstByte technical support team via their telephone number, email address, and ticketing system, but there is no live chat option. Nevertheless, the FirstByte technical support team is available 24/7. Although they have set a maximum response time of 24 hours, their technical team responds to most support requests in less than one hour. And, while FirstByte’s technical support team is relatively fast in responding to queries from customers, their attitude is unbecoming and sometimes, they are impolite. What’s more, this technical support team does not seem to have very advanced knowledge of hosting and how to address emerging issues from customers, making some of their responses unhelpful. For many customers, they’d do better finding answers on their own using the vendor’s fairly detailed knowledge base that includes an FAQ section and tutorials. FirstByte hosting solutions are specially designed for medium-sized businesses and large corporations with complex websites and databases. Given the unprofessionalism of this vendor’s support team as well as their apparent lack of the necessary hosting support skills, organizations that don’t have their own in-house hosting expertise and are interested in FirstByte’s hosting services should proceed with caution when trying out this company’s offerings. Wondering how FirstByte stacks up against other Web Hosting companies? Enter any other Web Hosting company and we will give you a side-by-side comparison.